Can Pat Buchanan Save MSNBC ? Pat Buchanan may be the only point of difference the network has: A political analyst who just happens to think that the Holocaust was exaggerated, the Jews run the US Government and claims that David Duke stole his ideas. I feel bad for MSNBC; it was just a few years ago that it seemed that the Microsoft/GE owned network would overtake CNN to become the number one choice for cable news. But Fox News has come out of nowhere to take over the number one position followed by CNN, while MSNBC has struggled at a distant third. Since its popularity peak, MSNBC has had undergone some very public missteps with the hiring and firing of Phil Donahue and Michael Savage. Things have gotten so bad just a month ago NBC and Microsoft felt the need to make a very public statement that they are not going to disband the network. Clearly MSNBC is a network that is in need of an identity. Fortunately for them I have a solution that will rescue America’s number three news network. MSNBC must stop trying to be everything to everybody and grab its own niche so it can generate a broad audience. And an easy answer is staring the network executive’s in their faces. All they need to do is almost all of the on-air talent and build the programming around its most marketable commodity, the man who was once a candidate for President, political analyst, Pat Buchanan. The All-Pat network would generate a loyal audience that no one would dare (or want to) take away. First thing in the morning the network could present a lighthearted news program (like Fox and Friends) hosted by Buchanan called: Those Crazy Neo-Conservatives Are Not All Jews –Just Mostly Jews. This fun morning frolic is based on Buchanan’s essay, “Whose War” where he blames the Iraq war on a bunch of mostly Jewish public figures such as Bill Kristol, Paul Wolfowitz, Max Boot and Richard Pearled. 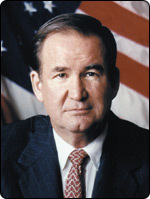 Buchanan has charged those public figures with” colluding with Israel to ignite those wars and destroy the Oslo Accords. We charge them with deliberately damaging U.S. relations with every state in the Arab world that defies Israel or supports the Palestinian people's right to a homeland of their own” he goes on to say, “For whose benefit these endless wars in a region that holds nothing vital to America save oil, which the Arabs must sell us to survive? Who would benefit from a war of civilizations between the West and Islam? Answer: one nation, one leader, one party. Israel, Sharon, Likud." When the opening bell on Wall Street sounds, the network’s focus could shift from politics to business news with a show called Things that Jews Own. This program will focus on another industry traditionally stereotyped as dominated by Jews. From Hollywood to banking, from the media to medicine, each day will profile a new industry with that unique intolerant Buchanan touch. Another question could be Hitler was a bad guy? On Pat's network the answer would be false. "He (Hitler) was also an individual of great courage, a soldier’s soldier in the Great War, a leader steeped in the history of Europe, who possessed oratorical powers that could awe even those who despised him. But Hitler’s success was not based on his extraordinary gifts alone. His genius was an intuitive sense of the mushiness, the character flaws, the weakness masquerading as morality that was in the hearts of the statesmen who stood in his path." - St. Louis Globe – Democrat, Aug 25, 1977"
Turning MSNBC into NNN, the Nazi News Network, and featuring a line-up of all Pat all the time will help the network to finally secure an identity and consistent ratings. The only bad part of the whole thing is that the rest of the present on-air staff would have to lose their jobs; since they are not bigots or anti-Semites they would not fit in. Of course, GE and Microsoft management would have to buy into this change, but I don’t think it would be a major leap after all if MSNBC felt that his views were abhorrent, they would not permit him to appear on their network. Especially during an election year Pat Buchanan is the only point of difference the network has: A political analyst who just happens to think that the Holocaust was exaggerated, the Jews run the US Government and claims that David Duke stole his ideas.